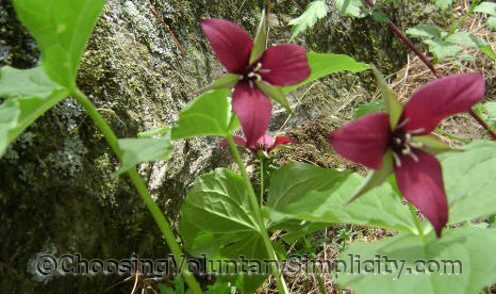 The common red trillium (Trillium erectum) grows in moist, wooded areas and can grow to any height between seven and twenty-four inches. The leaves are located underneath the flower and can vary greatly in size from plant to plant. 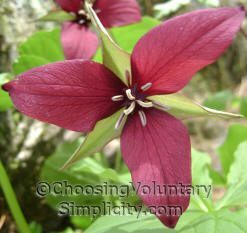 Trillium flowers have long, narrow petals and can be any color ranging from the deep red of the common trillium to the purple, pink, and white of the other varieties. The flower stem is very slender and often droops from the weight of the flower and leaves. After the flowers fade, reddish-purple seed berries form. There are more than forty types of trillium, but as the name indicates, they are all based on threes. Trilliums have three petals, three leaves, three sepals, a pistil with three parts, and six stamens (three in the foreground, three in the background). Red Trillium blooms here early in the spring. We have left several native red trilliums where they were growing naturally, and they are a vivid spot of welcome color before most of the plants in our gardens are producing flowers. 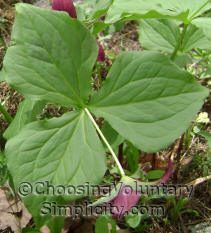 thanks so much for this – having just moved onto an acreage on Vancouver Island (Canada) I am discovering many new (to me) plants and found trillium in our woods. One flower was twice the size of my hand and a gorgeous pink like your photo, but with white edges. Glorious! 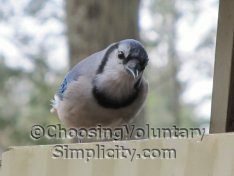 Love your blog….will keep reading! Thank you for this post. I have been trying to identify this plant with no success until I found your site. I have stayed to read more. I’m embarrassed to tell you how much time I have spent reading your posts since I found your site!